This latest book in the excellent Oslo Detective series featuring Gunnarstranda and Frank Frolich opens on a very cold 10th December with Christmas preparations in Oslo in full swing. On this occasion Gunnarstranda and Frolich play a subordinate role to Lena Stigersand. With the temperature at 24 degrees below freezing Lena is called to the harbour where a body has been discovered in the icy water. At first it appears that the smartly dressed man had fallen in - but Lena is not convinced. The only observers of the body recovery, other than emergency services, are journalists. As she goes to leave (after briefing them), one of the journalists, Steffen Gjerstad grabs her arm and introduces himself. This meeting has significant implications for both the investigation and her personal life. 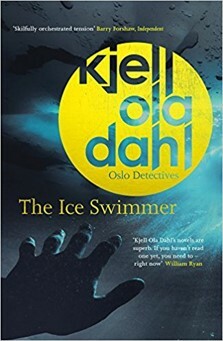 As she pursues various leads she is drawn ever closer to the centre of the Norwegian Establishment, which puts her at odds with a former mentor who has moved from the department to the Police Security Services. On top of the intense investigation, while coping with her mother's expectations for Christmas, she discovers that she has a health problem which she cannot ignore. She also cannot ignore the fact that the investigation might be getting closer to her private life than she would like. As well as the strong story-line there are some lighter moments, largely involving food and drink. The characters are an interesting mix of good, bad, smarmy, weak and the unfortunate. The interaction between characters, particularly Gunnarstanda, Frolich and Lena is evocative and well realised.